This Educational Action Research in Ireland space has been designed to showcase, interrogate and explore self study approaches to action research in Ireland and beyond. We would like to highlight the ever-increasing interest that now exists in practitioner based research and action research. We want to explore the appropriateness of self-study approaches to action research for practitioners. Our network for action researchers is called Network for Educational Action Research in Ireland or NEARI. Learn more about NEARI here. 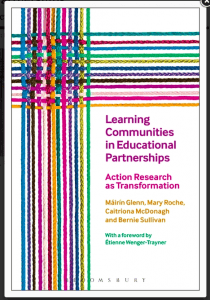 Our newest book is Learning Communities in Educational Partnerships: Action Research as Transformation (2017) and is available from Bloomsbury . Introduction to Critical Reflection and Action for Teacher Researchers (2016)and is available from Routledge . Enhancing Practice through Professional Development: A teachers’ guide to classroom research (2012) is also available from Routledge.